Day Twenty: When do you feel you’re the most attractive. Why? Whenever I’m confident and happy. I must be honest – this is normally when I feel at my most physically attractive i.e. when my hair has been coloured and blow-dried, or when I’m wearing a new dress and high heels. However, there are also times when I am definitely NOT at my best physically and I do feel attractive. This is always at a time of physical exercise! When I’m walking back from a yoga class, or when I’ve finished a 3 hour Wolf Run, I feel positive and confident about myself, which I believe is what makes me more attractive. 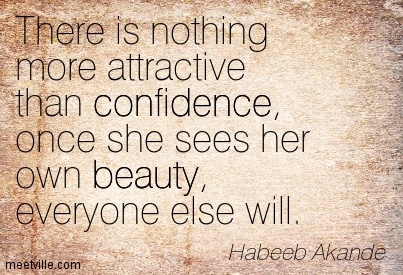 A great reminder that confidence is attractive and taking care of yourself is beauty. Thanks!